Economic information for Chileans or travelers in Chile. Is there a better alternative to IECX? Is IECX really the best app in Finance category? Will IECX work good on macOS 10.13.4? 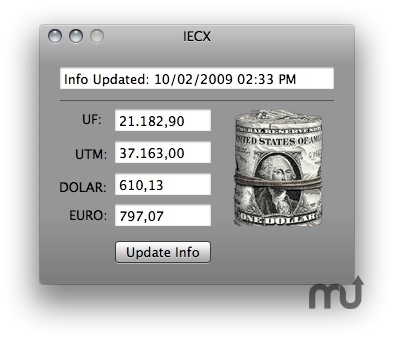 IECX is a free app to retrieve useful economic information for Chileans or foreigners visiting Chile. Dollar & Euro exchanges rates (relative to Chilean Peso). IECX update this info every 30 minutes, or you can refresh the info manually pressing "Update Info". IECX needs a review. Be the first to review this app and get the discussion started! IECX needs a rating. Be the first to rate this app and get the discussion started!